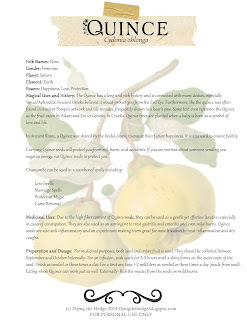 Magical Uses and History: The Quince has a long and rich history and is connected with many deities, especially Venus/Aphrodite. Ancient Greeks believed it would protect you from the Evil Eye. Furthermore, the the quince was often found in Ancient Pompeii artwork and tile mosaics, frequently shown in a bear’s paw. Some text even reference the Quince as the fruit eaten by Adam and Eve in Genesis. In Croatia, Quince trees are planted when a baby is born as a symbol of love and life. In Ancient Rome, a Quince was shared by the bridal couple to ensure their future happiness. It is also used to ensure fidelity. Carrying Quince seeds will protect you from evil, harm, and accidents. If you are worried about someone sending you negative energy, eat Quince seeds to protect you. Medicinal Uses: Due to the high fiber content of Quince seeds, they can be used as a gentle yet effective laxative, especially in cases of constipation. They are also used as an astringent to treat gastritis and enteritis and even mild burns. Quince seeds are also anti-inflammatory and an expectorant making them great for mouth washes to treat inflammation and dry coughs. Preparation and Dosage: For medicinal purposes, both seed and entire fruit is used. They should be collected between September and October. Internally- For an infusion, soak seeds for 3-5 hours until a slime forms on the outer coats of the seed. Drink as needed or three times a day. For a tincture, take 1-2 milliliters as needed or three times a day (made from seed). Eating whole Quince can work just as well. Externally- Rub the mucus from the seeds on mild burns.